Most Star Wars aliens tend to be anthropomorphic. Ssi-ruuk are carnivorous dinosaurs. Take a guess at what they're like. A phrase coined by Sci Fi author Robert J. Sawyer, describing a certain way of characterizing extraterrestrial races. Take a terrestrial animal, make it anthropomorphic, bipedal, and sapient, but rather than derive their behavior from humans with the occasional Furry Reminder, instead derive the majority of its characterization and culture from the terrestrial animal's behavior. Sawyer's hypothetical/satirical Intelligent Gerbils live in cities powered by erudite individuals running around in big wheels; they take water from tubes coming out of the walls and sleep in piles of cedar chips. Could be regarded as the animal version of Rubber Forehead Aliens, except when the non-human psychology clause of Starfish Aliens kicks in. Distinct from Alien Animals in the sense that they're not literally a terrestrial animal, but are obviously inspired by one. Compare Bee People. A subtrope of Petting Zoo People, and related to Funny Animal, Civilized Animal, and the Planet of Hats. These usually end up looking like Humanoid Aliens, for obvious reasons. See also Animal Stereotypes and Furry Fandom. For specific varieties, see Catfolk, Lizard Folk, Fish People, Pig People, ad infinitum. Evolutionary Levels are often implied - apparently if you want sapience, intelligence and organised society, they always come with two arms, two legs and an upright body plan. For an interesting analysis and criticism of this trope, see this Tetrapod Zoology post. Keroro Gunsou. The title character and every other character from Planet Keron are from an alien race that resembles cartoony anthropomorphic Frogs and Toads. Many other alien races based on animals appear too, although very often only their head is actually influenced by one animal or the other and their body is completely human. Astro Boy features a race of aliens resembling grasshoppers whose social structure is somewhat extrapolated from grasshopper behavior. For example, it's perfectly legal for them to fight to the death over a mate. Several comedic series, such as Space Pirate Mito and D.I.C.E., have anthropomorphic terra-based animals as aliens or galactic citizens as (generally) lower classes to the humanoids. Often appearing as background characters, pirate crews, and servant/slave races. Too many to count in Star Wars. About 1/4th of all of the Star Wars alien races fall into this category: bats, lizards, moths, squid, goldfish, frogs, etc. etc etc. Cats and rabbits are some of the most common, particularly in the comics made in the 70s by Marvel. Creators tend to make up their own new species rather than going with the previously-established, say, small peaceful flightless birdlike aliens whose hat is academia. This becomes a rather hilarious point in an EU book that has Han ending up at a intergalactic pet competition. Humanoid aliens tend to have small furry pets, Lizard aliens seem to prefer more insect-like pets and of course the sentient insect species like (non sentient)humanoids as pets. Han noted that it was best to observe a pair for a minute if you weren't sure which one was the pet, case in point the Chadra-fan (giant rat) with a large bipedal lizard pet that was twice its size. Mostly averted with the Men in Black franchise, which has some truly alien-looking alien designs. Except of course, the main recurring antagonists—the Bugs, a race of scary space cockroaches. The Triceratons, from Teenage Mutant Ninja Turtles, are an alien race based on Triceratops. The Pemalites, from Animorphs (and their Android creations, the Chee) are doglike in both appearance and attitude. There's an attempt to justify this by claiming it's dogs that are actually Chee-like. Dogs were the result of (ahem) genetically mixing Pemalites with Earth wolves. All of the major alien races of Robert Asprin's Phule's Company series can be described thusly: cats, slugs, lizards, and warthogs. Just not when Phule himself is around. Marion Zimmer Bradley's Darkover stories: the cat-men (or cat-people). C. J. Cherryh did this very well with the Chanur series. The Hani species are essentially terrestrial lions given intelligence and stood on their hind legs. The way that the biological imperatives of a pride-grouping species would impact a sapient culture are shown, without rubbing it in the reader's face. It's "just" background. Every alien race in Debora Chester's Alien Chronicles series. The bird-like garuda from China Meiville's Perdido Street Station. Most of Mieville's "Xenians" seem to fit this trope to some extent. The hotchi (hedgehogs), the vodyanoi (frogs), the grindylow (eels), the Weavers (spiders) and the beetle men (guess) are just a few examples that spring immediately to mind. The Kzin, from Larry Niven's Known Space series are sometimes described as "a race of aliens resembling eight-foot cats". A more detailed description weakens the resemblance considerably, what with hairless tails, ferret-like body shape and other distinctions. Averted by most of the rest of Known Space aliens. Some are very strange indeed, but with their evolutionary processes given a lot of thought. However, it was his first published story, and he claims to have written it in high school. Andre Norton: the Salariki (Catfolk), Zacathans (Lizard Folk), Trystians (Bird People), etc. etc. etc. Later books in the series introduce the Cheerick, who are almost literally intelligent gerbils. One character describes them as looking like six-foot-tall, spear-wielding hamsters, to which another character replies, "They don't really look like hamsters. More like chinchillas." Robert Silverberg's Downward to the Earth: The Nildoror are basically sentient elephants who, for spiritual reasons, become sentient bear/tapir creatures every few years. Kathleen Sky's Star Trek novel Death's Angel features a whole conference of Intelligent Gerbil aliens: a giant blue crocodile, a koala, a cat, a bat, a lamprey, etc. With the occasional exception including a vampire and a talking pyramid. The character names aren't much more creative; the cat is Neko (Japanese for cat) and the pyramid is Hotep. The lizard-like Tagorians from the Noon Universe of the Strugatsky Brothers. Also subverted with the Headies/Golovans who look kinda like dogs (with very large heads), and indeed apparently descended from some sort of alien dogs (it's commonly assumed that they mutated thanks to the fallout of a nuclear war), but their psychology doesn't have much to do with any of the stereotypical dog-like characteristics; it's just thoroughly inhuman (to wit, they are mistrustful of technology, highly enigmatic, seemingly unemotional and above all practice evolutionary pragmatism on an apparently everyday basis; the latter in particular definitely overrides any dog-like loyalty they might have had). A. E. Van Vogt's Voyage Of The Space Beagle had a cat-like alien called Coeurl (which has since appeared in other media) and telepathic alien birds called Riim. James White used this in some of his Sector General stories. Hospital Station, "The Trouble with Emily": The titular character is essentially a brontosaurus (she's called Emily Just for Pun by the engineers who maintain her living area, especially the crew of the tractor beams that keep her from thrashing around if she becomes agitated). Hospital Station, "Outpatient" features the staff's first encounter with the Ians, who reappear in Star Surgeon, in the form of a youngster rescued from a wrecked alien hospital ship. The Ians as a species resemble giant dragonflies as adults; the patient is in chrysalis form, which seriously confuses the staff until Conway works out why the detected vital signs are so messed up (they're getting two sets, one from the "caterpillar" form that's being sloughed off, one from the adult stage). The patient's actual original medical condition is that it can't break out of its chrysalis on its own and thus needs some minor but time-critical surgery. Ambulance Ship, "Quarantine": A youngster belonging to an unknown species is rescued from a wrecked spaceship. The medical staff find out the hard way that the new species' physiology is essentially like that of skunks, though with a mild poisonous effect rather than a bad smell. 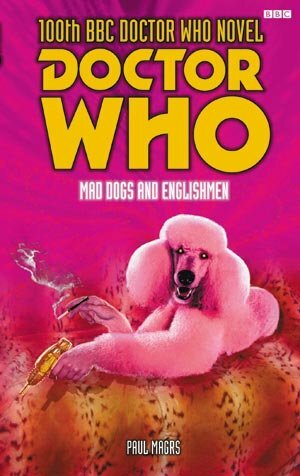 The denizens of Dogworld in Mad Dogs and Englishmen are, well... yeah. It's that kind of novel. Also in the Doctor Who novels, the Pakhar are hamsters. Toby Frost's Space Captain Smith books include the Ghasts, a fascist species of mansize army ants; Beetle People, whose culture revolves around collecting and rolling dung; and most of all the Yull, 6-foot lemmings who regard suicide as the highest virtue, and hence follow a samurai honour code taken to a ludicrous extreme. Admittedly, they are comedies. The Lodgeless Ones in Marti Steussy's Forest of the Night resemble big cats (humans tend to call them "tigers") with feathers instead of fur. They're predatory, nomadic, and rather territorial. Kargans, in Dreams of Dawn, resemble some sort of crustacean (and undergo multiple metamorphoses, and have Mirror Chemistry). In their not-yet-fully-sapient larval stage, they scavenge like crabs; when adult, they're at least partly aquatic. The briefly-mentioned Houri seem to be some sort of simian. They're tree-dwellers by choice. The Lindauzi in Warren Rochelle's The Wild Boy. There is a scene where people disagree about whether they look like cats, dogs or bears, but the cover shows them to look a lot like Earth bears. The one difference is that they have crests running from front to back on their heads and cat-like retractable claws. And if they lose their sentience, they'll go back to hunting and killing prey like grizzly or polar bears. There's plenty of examples in Doctor Who: the Judoon are rhinos (who are sentient, but not necessarily intelligent), the Tritovores are flies, etc. Occasionally, there's some alien traits for the aliens: Vespiforms are wasps and shapeshifters, the Cheetah People are cheetahs and natural teleporters, the Foamasi are chameleons and are immune from radiation and can compress themselves into human suits. Lexx had the Insect Civilisation. Flash Gordon: the Lion Men of planet Mongo. Buck Rogers had Tiger Men from Mars. And a single guy with tiger stripe tattoos named Tiger Man in the 1970's TV series. Traveller Tabletop RPG: the Aslan and the Vargr. Cats and dogs (well wolves actually). The Vargr were genetically engineered by the Ancients from Earth dogs a long time ago. Aslan really behave more like the more warlike tribes among humans then like lions. They have a sense of tribal cohesion, hierarchy and a stern honor code and so on. Indeed canon actually says right out that they have a lot in common with humans. Star Fleet Battles: Lyrans (lynx) (The Kzinti were already official in-universe, giving two "cat-people" races (who hate each other)). Starfire board game: Khanate of Orion (another touchy cat-race). GURPS Space allows alien designs from intelligent gerbils (literally if you wish) to "plasma life". The Bio-Tech book has intelligent gerbils called Tek-Rats. The Jokaero in Warhammer 40,000. Sort of. The Jokaero are actually non-sapient, their ability to create fantastic technology an instinct hard-coded into their DNA by the Old Ones. As a result they're actually used by the forces of the Inquisition and Grey Knights, since while the Imperium is notoriously xenophobic toward other intelligent species, they have no problem with using alien animals as livestock. For another example, the (relatively) docile Tau are supposedly evolved from three-toed grazing animals, their allies the Kroot from birds, and the Vespid from insects. All are more-or-less Humanoid Aliens. The "Tau as descended from grazing animals" was an in-universe piece of speculation/propaganda. They are apparently another species that evolved from an alien aviform, and their Air caste still retain rather obvious (vestigial? Air caste stations tend to have far lower gravity, so possibly not.) patagium. Warhammer Fantasy meanwhile has the Skaven, anthropomorphic rats who live underground, constantly squabble, are disease-ridden, and don't attack anything bigger than them without having a 10-1 numerical advantage. They also reproduce like crazy and the albinos or big ones get special treatment. One of their war-machines is a giant exercise wheel with guns. The Lizardmen are aloof, stubborn and set in their ways, though not strictly speaking Abhorrent. The Aeriad, Ferrans, Gryphs, Imrians, Jaka, Saurans, and Stryx of the Talislanta game-setting are Intelligent Gerbil songbirds, rats, hawks, fish, panthers, lizards, and vultures, respectively. Though considered reptiles in later editions, kobolds in the Basic/Expert/etc version of Dungeons & Dragons were often portrayed as Intelligent Gerbil versions of dog-people, with yapping voices and wagging tails. They were considered to be a smaller cousin of Gnolls (Hyena-people). Mystara setting, including Savage Coast is full of them. 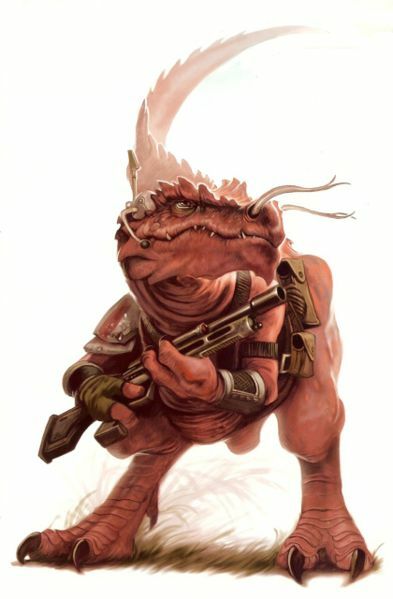 Aside of more or less standard races there are: Aranea (scheming and crafty were-spider people), Lupins (canine humanoids, with teamworking/Lawful inclinations), Rakasta (proud warlike feline humanoids), Tortles (bipedal turtles), Gurrash (big brutal crocodile-humanoids), wallaras (stealthy chameleon-men), Caymas (small agile lizard kin). Races of the Wild claims that Gnoll society is very much based on the social structure of hyena packs. It doesn't always agree with the way they're treated in other material, but is the only source to explicitly go into detail about them. Lots of these in Magic: The Gathering, catfolk, lizards, elephants and insects being just a few examples. Part of the reason for them may be game balance, to keep the game's few humanoid races from dominating the creature type distribution. The Roden from Burning Wheel are pretty much intelligent human-sized anthropomorphic rodents who divide themselves into Country Mice (Kind of Vegetarian Amish types who look like field-mice) and City Mice (stereotypical criminal rat-person, with 'Pinky' and 'The Brain' included as possible life paths, Narf) with murderous cultists and albino mystics thrown in for good measure. The World Tree RPG is rife with them: Cani (dog-folk, focused on personal relations), Herethroy (insect-folk, mostly farmers), Gormoror (bear-folk, honorable warriors), Khtsoyis (squid-folk, not too bright... but brighter than they let one), Sleeth (intelligent cats), Rassimel (raccoon-folk with obsessive-compulsive tendencies), Orren (otter-folk with short attention spans), and Zi Ri (dragon-folk who live a looooong time... barring accident). Actually, the game's codex describes Salarians as being warm-blooded amphibians. The Luminoth in Metroid Prime 2 are a race of giant anthropomorphic moth-people that seem to have an obsession with light. Some of the alien species in Star Control series fit this trope. Sword of the Stars. The Hivers, Liir, Tarka, Zuul and Morrigi are Intelligent Gerbil ants, dolphins, crocodile/ape hybrids, tasmanian devils, and dragon/crow/magpies, respectively. The Iskai in Albion look like anthropomorphic cats that besides their appearance, resemble humans a lot, at first glance. On second glance, you realize that not only are they completely alien, but have some very bizarre, logic defying traits. This is even lampshaded at one point. Semi-intelligent animals pop up in various forms in World of Warcraft, such as the raptors, who have been known to ornament their bodies with feathers, seem to have a vague hierarchical society and are dexterous enough to unlock and open doors with their little foreclaws. Anyr are often dubbed horses, but have large donkey-like ears, unicorn tails, and parrot feet. Vidians look roughly like Kirin, except when they look more like Eastern Dragons. And among the unnamed species, we have four-armed rabbits, tentacle-haired felines ("Sea Lions", perhaps? ), and we never have been given a proper name for Addy's species (or for her Efreet in the Bottle) -- she looks like a simple (albeit very pink) lion centaur, but she has leopard spots going down her back as well. Uma and her father in Everyday Heroes. Holy cow! The Nemesites of The Inexplicable Adventures of Bob are giant butterfly people. Their culture does not appear to be butterfly-like, however. Not an example, but too good to pass up for this page: Artie (and some of his not-quite-as-transgenic brethren) of Narbonic is literally an intelligent gerbil; albeit one who is sometimes subjected to transgenic processes of dubious scientific merit to grant him human form. The Loboans from Ben 10 which are space wolves. Also Stinkfly (giant insect) and Ripjaws (fish man). The sequel series Alien Force has even more, such as Big Chill (moth man), Jetray (manta ray that can 'swim' in the air) and Humungasaur (dinosaur). Though the one with truly animal-like behavior is Spidermonkey, who acts hyper and chimp-like. The Kzinti appeared once in Star Trek: The Animated Series, and there was also the Caitians, a race of Catfolk. He hates when people pronounce it "Hamster-wheel", though. The Forest Tales stories (here) has the alien species Caitians (it was originally a Star Trek Fanfic), Voxxans, and Rakshani (Proud Warrior Race Guy, also possibly Terran semantic imperialism because Rakshasa were oriental cat-demons and D&D monsters before they were aliens), but also more alien aliens. Tasakeru: The eight sentient mammal species in this series are basically a mixture of this and Petting Zoo People. The D'yimyi of the planet Diyim'yi, found in http://home.earthlink.net/~otrstf/ - an online-published novel. Physically, they resemble foxes, but they're from another planet, and a great example of this trope in action. This page was last edited on 17 September 2018, at 12:53.